From the increased popularity of front loading washing machines, to an increased use of cold water detergents and wash cycles, consumers are becoming more attuned to energy- and water-saving technology and practices. Improvements in clothes washing are helping consumers save more energy and water than ever, but there are still significant savings to be realized in the residential sector and even more so in the largely untapped commercial laundry sector. A new white paper by the American Council for an Energy-Efficient Economy (ACEEE) and the Natural Resources Defense Council (NRDC), Saving Water and Energy through Clothes Washer Replacement in the Great Lakes Region, profiles various opportunities for energy and water savings in the residential and commercial sectors. While the report focuses on identifying energy- and water-saving opportunities as part of the development of an innovative program for the Great Lakes states, the potential for savings in these markets can be found throughout the country. For about 20% of households in the country, clothes washing is done regularly at a laundromat or multifamily laundry room. Commercial machines are used much more frequently than residential units (almost 4 loads per day versus about 1 load per day). To boot, only 32% of the commercial washers sold are efficient units—and as a result, the energy and water savings that can be realized from upgrading to more efficient commercial units are substantial. Opportunities exist to create programs that target specific portions of these commercial laundry markets. For example, single load (also known as “family size”) commercial washers that are primarily sold for multifamily laundry rooms can be replaced with more efficient units, reducing energy use by 30% and water use by almost 50%. Additionally, incremental temperature pricing for water temperature settings can help laundromats or multifamily laundry rooms realize energy savings of 25–30% by providing customers with a price incentive to cut down on hot water washing. Opportunities also exist to extract additional savings from the residential sector, which is not fully saturated with efficient units (64% of units sold are ENERGY STAR™ as of 2010). The TopTen USA and ENERGY STAR Most Efficient lists, which designate the most efficient products among those that qualify for the ENERGY STAR designation, are beginning to be used in some utility programs to offer rebates for only the most efficient products on the market. 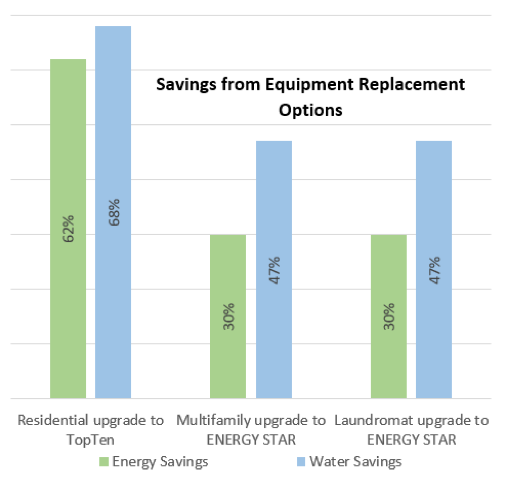 Since clothes washer energy and water use varies significantly among units (even among those that qualify for the ENERGY STAR list), the savings that can be realized from programs targeting only the most efficient units can be substantial. A TopTen USA residential clothes washer uses about 40% less energy and 50% less water than an already efficient ENERGY STAR model. Our white paper finds that the diversity of the commercial market necessitates targeted approaches to address the specific energy- and water-saving opportunities in each sector. Efforts to better understand energy and water consumption in laundromats, multifamily laundries, and on-premise laundry facilities can also help transform the commercial clothes washer market and sell more efficient units. Opportunities exist for water and energy utilities to collaborate on programs to increase the efficiency of the clothes washer stock. The next step in this collaborative project is for NRDC and ACEEE to design and implement a pilot utility program for a target state in the Great Lakes region. By doing so, we hope to wring out the energy, water, and money that can be saved in the clothes washer market.